Travertine is a highly porous, beautiful, natural stone that is known for it’s versatility. Travertine is so adaptive in application that it has become one of the most popular choices of stone to use in homes for showers, kitchen counter tops, back-splashes, indoor flooring, courtyard flooring, pool surroundings and more. However, as mentioned, Travertine’s surface is extremely porous, lending it to be covered in many tiny holes that can be problematic when used in your home if it is not properly filled. 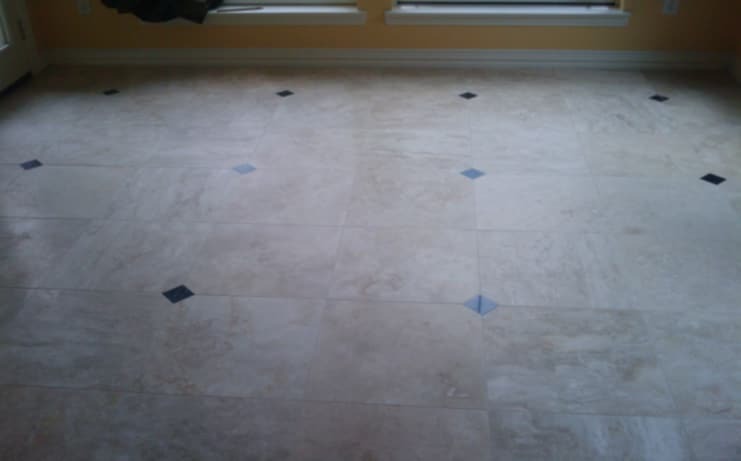 It is important to seal indoor Travertine to protect the integrity of the stone. When the holes are not filled it leaves the stone vulnerable to moisture, corrosive materials and is quicker to damage. Filling outdoor Travertine is important for all of these reasons as well as to protect the stone against extreme temperatures and weather. In the Winter, if the temperatures drop below freezing, the stone is much more likely to crack with unfilled holes. First its important to carefully clean the surface with a dry rayon mop, static pad or hard surface vacuum to remove all of the dirt from the stone. Then, once you’re sure the surface dirt has been removed, it is safe to clean the stone with water and a specialized cleaner. If you aren’t careful removing the dirt with the initial dry cleaning, the moisture from a wet clean can push the grime and sediment deep into the stone. Once the Travertine is completely dry, you can proceed to fill the holes in the stone’s surface. Using an epoxy grout, deeply pack the holes, wiping away the excess that collects on the surface. It is extremely important to make sure the holes are packed in firmly so the epoxy resin bonds fully to the stone. If done properly you will be left with a smooth, uniformed stone surface that is more secure and will last longer. Leave a job this important to the professionals at Modern Stone Care. We proudly serve The Greater Houston Area, including but not limited to Atascocita, Bellaire, Clear Lake, Cypress, Friendswood, Houston Heights, Houston, Humble, Katy, Kemah, League City, Kingwood, Memorial, Missouri City, Montgomery County, Spring, Spring Branch, Stafford, Sugar Land, Tomball and The Woodlands.